A great deal has been written on the value of large outdoor aviaries to parrot breeders. I agree, but this need not prevent those without access to outdoor facilities from experimenting. Well-habituated pairs of African Gray, Amazon and other fair-sized parrots have nested in spacious, indoor cages. Birds housed outdoors are often stimulated to come into breeding condition by natural fluctuations in temperature, humidity and day length. While seasonal changes will exert some effect on indoor birds, it is important for us to step in and “help nature along” when it comes to house-bound birds. Researching your bird’s natural habitat, with particular attention to seasonal variations of all types, is of primary importance. For this work, I have found books focusing on natural history, such as Mr. Forshaw’s classic Parrots of the World, to be indispensible. Articles on captive breeding are useful, of course, but individual personality plays such a big role in captive reports that the importance of natural stimulation can be over-shadowed. Use light timers to mimic the photoperiod that occurs in your pet’s natural habitat, and be sure to provide full spectrum lighting; bear in mind that window glass filters-out beneficial UVA and UVB radiation. For those species that breed at the onset of the rainy season, daily misting or a timed fogger, may be helpful. A well-balanced, varied diet is essential if your birds are to breed – in just about every animal species, reproduction is the first process to be shut down if all is not well nutritionally. 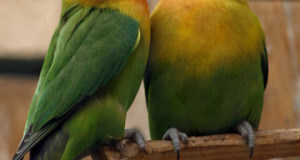 The provision of novel foods, or of extra amounts of certain foods, may also be important in bringing parrots in to breeding condition. In nature, the onset of the nesting season often brings with it an abundance of foods not available at other times of the year. Insects, flowers, nectar, shoots, certain fruits and others can be used to promote breeding readiness in captivity. Again, the key lies in a thorough knowledge of your bird’s natural history. Choose the largest cage possible for your potential breeders. African Gray Parrots, Red-Shouldered Macaws and similarly-sized birds have been bred in cages measuring 4’ x 4’ x 3’, but more is better – building your own cage may allow you to maximize the available space. Many successful indoor breeders suspend their cages from the ceiling with heavy-duty lamp chains. If you are as “unhandy” as I, hire an expert – in addition to the dangers involved, nothing so dampens a parrot’s ardor as does having its world crash to the ground! 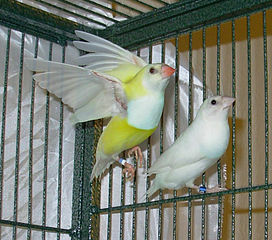 The breeding cage should be located in a quiet room, even if the birds are used to disturbances. Personalities often change dramatically during the breeding season – few birds will nest if the site is not secure. Gauze drapes or shower curtains hung near the cage can be useful in screening the area, and quiet music will drown out disturbing noises. 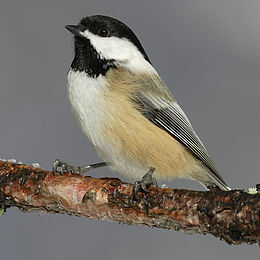 Sounds of other birds – even former “friends” – can upset a breeding pair. It’s a good idea to whistle each time you approach the room, so as to avoid surprising the birds. This should be done even for well-habituated pets.